Lock in a great price for Riffelhaus 1853 – rated 9.3 by recent guests! Food is good especially for dinner. Pool and Spa are also good. Room is cleaning. and Nice view if the whether is clear. Amazing property! The staff was super helpful and kind. The food was delicious and We loved this place and can’t wait to come back! The water pressure in the shower was amazing! The room was so comfortable (especially with the windows open, breathing in that fresh mountain air all night). Breakfast and dinner were amazing! Room was clean and couldn’t beat the location! The view of the Matterhorn was incredible! Everything is wonderful here. Location, rooms, spa, breakfast, dinner and service. View and staff - especially Dunni who was very happy and helpful. 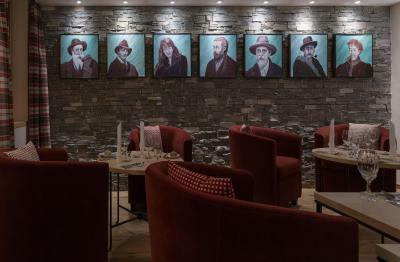 While everyone else has to take a long treck in Zermatt to reach the slopes if you stay at the Rieffelberg you just step on your skis and go!.. Amazing views, just wonderful. Great team at the kitchen and service. Friendly staff, cozy feel, beautiful location, and great food. 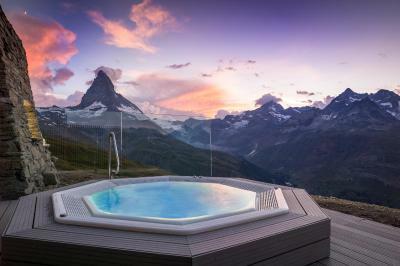 This hotel is located above the town of Zermatt and the views are amazing! We would defiantly come back and stay again. Its a perfect couple getaway. 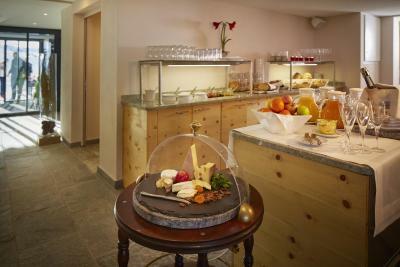 Breakfast is great, including freshly baked breads, delicious cheeses and more. Dinner was also great, multiple coarse meals with friendly wait staff. Awesome desserts! 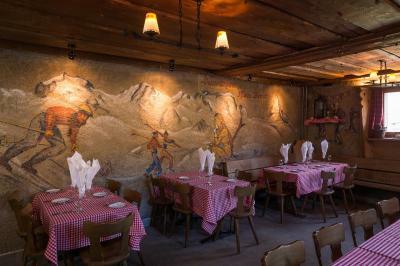 Riffelhaus 1853 This rating is a reflection of how the property compares to the industry standard when it comes to price, facilities and services available. It's based on a self-evaluation by the property. Use this rating to help choose your stay! 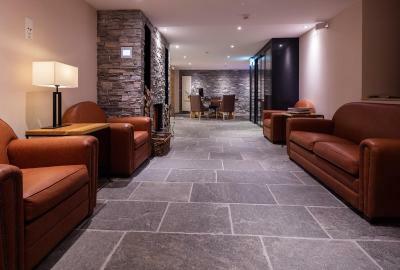 One of our top picks in Zermatt.Located at 9 feet above sea level, Riffelhaus 1853 offers panoramic views of the mountains around Zermatt from all rooms. 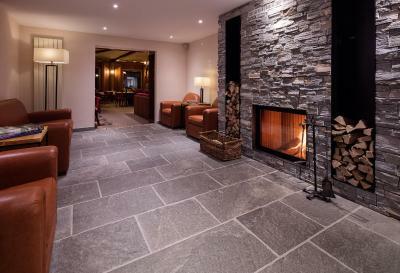 Located right next to the ski slopes with ski-to-door access, it offers a traditional restaurant, a spa area, an outdoor hot tub with views of the Matterhorn, and free WiFi access. 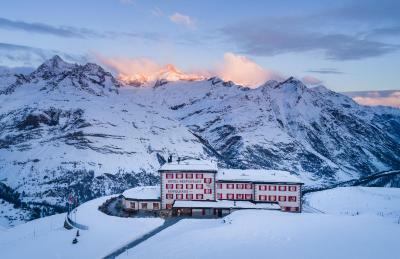 The Riffelhaus is a historic mountain hotel dating from 1853 that was renovated in 2014. The traditionally furnished rooms offer satellite TV and bathrooms with bathrobes and hairdryers. 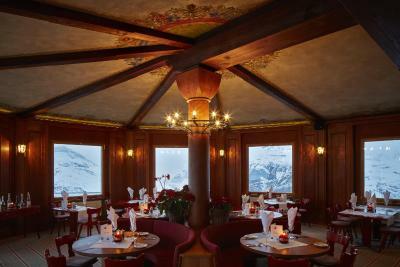 From the balconies in the some room types, as well as from the sun terrace, guests enjoy direct views of the Matterhorn. 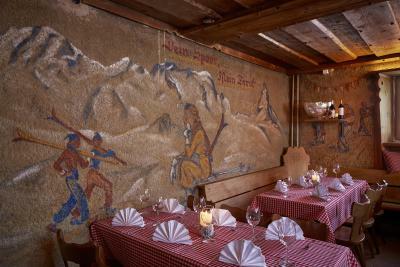 The restaurant serves classic Swiss cuisine. 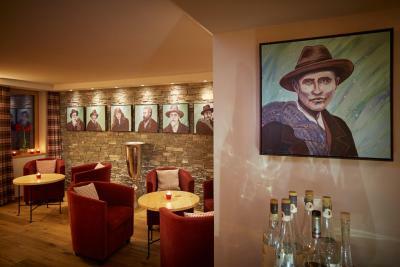 Guests can also enjoy a bar, a lounge and a library on site. The spa area features a sauna, a steam bath and a relaxation room. 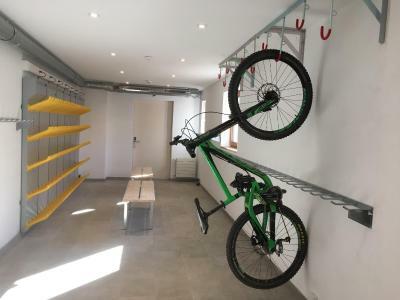 A ski storage room in winter and a bicycle storage room in summer can be used free of charge. 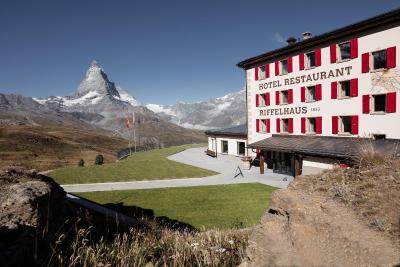 The hotel has officially been rated as "Bike Hotel" by the Swiss tourism association. 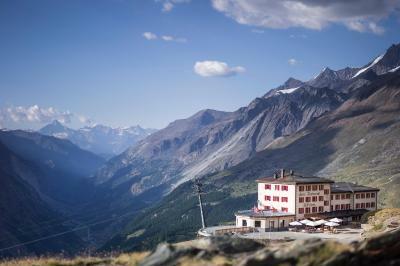 Riffelhaus 1853 can only be reached by mountain railway from Zermatt. The ride takes 23 minutes. 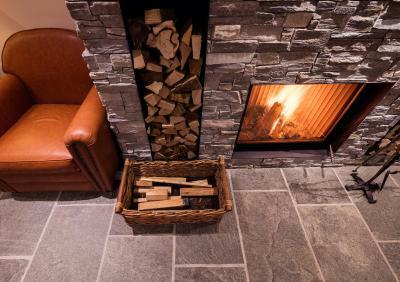 When would you like to stay at Riffelhaus 1853? 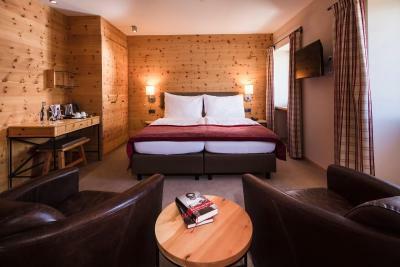 Rustically furnished room overlooking the mountains, with satellite TV, a safe, and a bathroom. 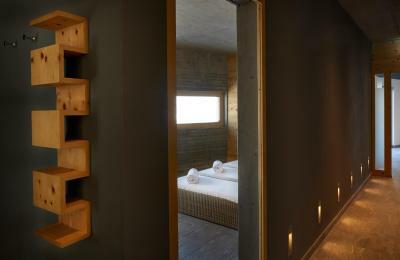 Rustically furnished room overlooking the mountains, with satellite TV, a sofa bed (55 in wide), a safe, and a bathroom. 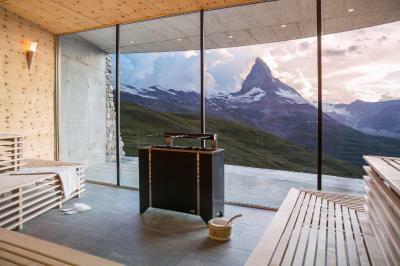 It features a balcony with views of the Matterhorn. 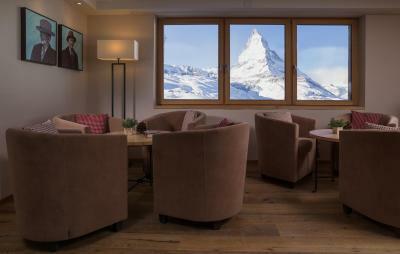 Please note that the view of the Matterhorn is only from the balcony, not from inside the room. Please note that the room rate is based on 2 guests. Maximum occupancy is 2 adults and 2 children or 1 extra adult on a sofa bed (see Extra Bed Rates). 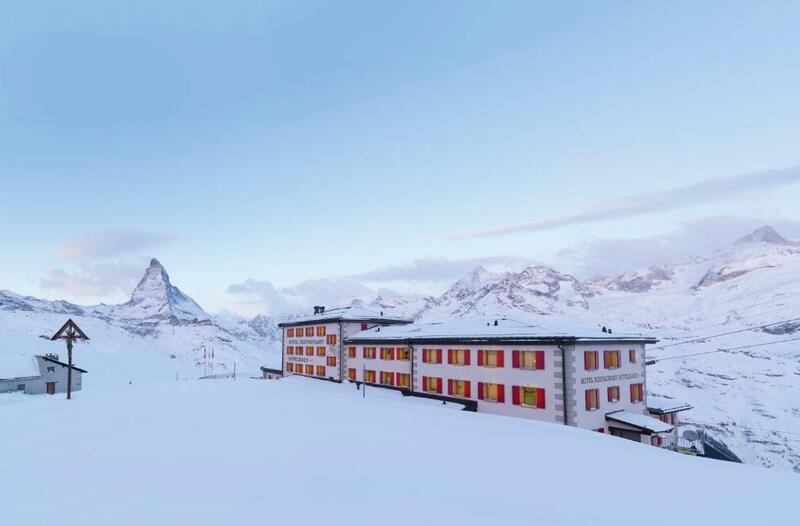 Rustically furnished room with a balcony overlooking the Matterhorn, satellite TV, a safe, and a private bathroom. House Rules Riffelhaus 1853 takes special requests – add in the next step! One child under 12 years is charged CHF 95 per night when using existing beds. Riffelhaus 1853 accepts these cards and reserves the right to temporarily hold an amount prior to arrival. Please note that Zermatt is car-free. 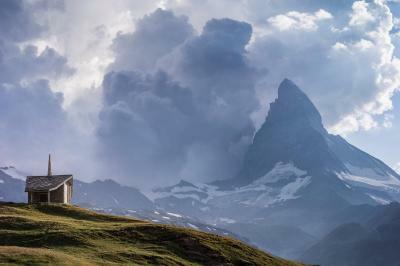 You can only drive as far as Täsch and then reach Zermatt by train. The station of the Gornergrat mountain railway is right next to the train station. Please note that the hotel can only be reached by railway. 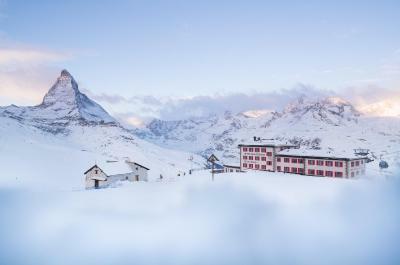 The last train leaves Zermatt at 19:24 (seasonal schedules vary; please consult a timetable). The “Swiss Postcard“ is accepted as payment. Please note that the on-site restaurant is the only restaurant in the area. The view and location is amazing. 4th, The outdoor jacuzzi at this hotel is the highlight which opens in very short period from 3pm to 8pm. 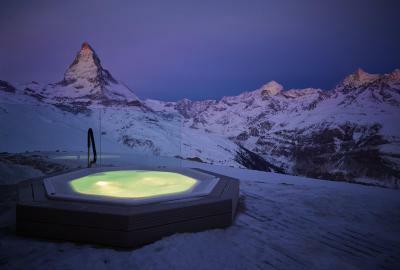 It means that you have only 1 time at arrival day to use the Jacuzzi. The weather at Zermatt is unpredictable and our arrival day is one of those bad days which we can't see the view at all. We have asked the reception whether could we get inside and only take a photo in the next day and they were fine with that. The next day, we asked one lady to help us getting in and she unlocked the door for us. After we got in, there was a guy sleeping inside the living room at Jacuzzi and he yelled on us “Get out, this is closed” First, we did not get in without permission and 2nd, you shouldn't ever say that to the customer or anyone in the world. The last was with the same upset man at the first day. One of us got some accident from sledge and cannot walk so she was waiting at the train station. We planned to leave the hotel earlier so the rest of us came back to get languages from the hotel. We took all stuffs downstairs to check out and asked for luggage service to deliver to train station. They said you have to tell us 30 mins earlier. By the time we asked, it was around 25 mins before the next train. I understood that this is less than 30 mins but this is an emergency case. The same upset guy from the first day rejected our request with very moody face and shouted out like "I don't like it" He is unreasonable man in this world. Obviously, one of our friend got in an accident and safety should come first. Also, after that, we realized that they rejected because if they go later that our request, they can pick up the new people who are coming to the hotel in the same time. We thought that the employees who worked in this hotel should improve their service mind to serve guest who flies around the world to stay at your hotel. They obviously look down and insult Asian People. However, the view was nice but cannot bear with the service. We stayed at hotel for 1 night in 2 rooms. Before we arrive the hotel, we made a call to reception to book the appointment for luggage to carry to hotel which we cannot carry all to the hotel by ourselves from the train station. They said that we needed to make a call when we arrived the train station at Riffelburg only. That's fine. Once we arrived, we called and one upset man came to pick our luggage and said with moody that he came here earlier but no one showed up. That's one shot. Second, while we are waiting for reception to be free, we were talking in our language. Then, the reception said to us " who can speak English here?" The way she said that is not a funny thing, obviously she was mean to us. This was so rude and unacceptable. We felt like they looked down on Asian People. We were very upset to the employee's manner and that should not be the first thing to say to others not only for receptionist but also for anyone in the world. Third, at the evening we were a very first coming down to the restaurant to have dinner and we asked to move to sit by the window. The waiter in the restaurant said the tables were reserved already. We were fine but just asked how to make the reservation then we can make it next time. But the waiter said that is for people who are staying here for 2 weeks not you who are staying here only 1 night! The tone of waiter is so rude and implied very bad manner to us. First of all, that is not the answer for our question and second it does not matter how long we stay, but everyone should have the same accessibility. Sauna, Stream, Hor Tub have limitations with usage and working hours. Pillows are too soft. Staffs were not helpful, just doing their jobs. Outdoor jacuzzi really small and had only one jacuzzi so not enough for hotel guests. You can imagine this hotel had guest around 70-80 guests per night and time for outdoor jacuzzi operate time just 15:00 until 20:00 that around 5hrs./day that mean you can enjoy with jacuzzi maximum just 3 mins/person so how it enough???!!! Very long queue... also table for wait queue near jacuzzi are clear glass window can see when you stay in jacuzzi!!! It really un-private. Outdoor jacuzzi and sauna room are nice view. Service of staff needs to be improved. The splendid view that is situated right in front of the Matterhornand snow ski. The outdoor spa and Suana exceed our expectation! Breakfast and dinner is good. Room is just so-so for the price you paid. However, I Guess it's the scenery and outdoor spa that is the strong attraction. 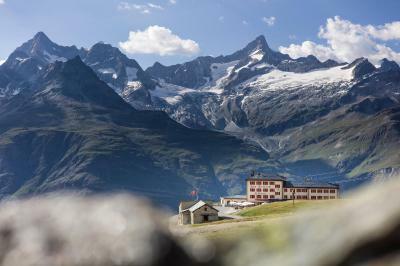 I and my friends booked Matterhorn view rooms with balcony for 2 nights but only my friends got it, I got the one without balcony :( . Anyway, we can't see Matterhorn from the room at all because of whether is so sad on these 2 days. Moreover to up and down to and from the resort, we need to take Gonergrat train every time which is costly. The food in the evening is not so good. A few years ago there was much more choice. Now salad bar is always the same. Warm food often dry. Super staff, perfect service. Warm welcome: a lot of info before arriving by email, take our luggages from the station to the hotel, welcome drink and a kind receptionist. Delicious, generous breakfast and dinner. Comfortable, clean room with marvellous view. 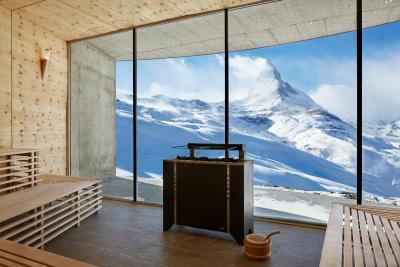 The wellness center was amazing, large sauna with direct view to Matterhorn, jacuzzi in front of 2 meters high snow wall. It was a unique experience for us. Perfect location for skiing. Highly recommended. you have to check the weather before you go. the location and facility are perfect !!! it's romantic place in the middle of a sea of snow. The check in lady was lovely. The restaurant staff were terrible, 2 of them were standing in front of me and another guest at the salad buffet swearing about another table. Should be better equipped for vegan and vegetarians.